See this image here? This is what bothers me about the whole GMO debate. A libelous statement presented as truth labeled as ‘Opinion’. There are sneaky things going on. A PR masterpiece of epic proportions is underway to sway public opinion by any means necessary. There was the Vandana Shiva hit piece in the New Yorker last winter, then the Smithsonian talking about GMO-hating hipsters, followed by some crazy article in National Geographic comparing anti-GMO folks to anti-vaccine folks. 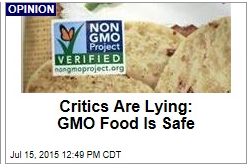 Slate recently piled on with a person spouting off research purporting that GMOs are safe and healthy. In this massive PR push, the hacks are relying on a time-tested, mother approved format to divide and conquer, obscure and refute, and force through an agenda. I don’t oppose GMOs on health claims. Or because I hate science. I oppose them on grounds of sovereignty and choice. It’s the continuing capital creep that has driven people out of work for generations and consolidated more and more power in the hands of few. But back to the whole PR thing – and this is what interests me while watching this whole debate. Back when Monsanto introduced BGH/rBST, they touted it as a safe alternative for farmers to effortlessly produce more milk from the same cows. An FDA – stacked with folks who worked at some of these companies – approved it for use. Studies paid for and bought by the company put out similar ‘BGH is safe’ mantras, but ultimately consumer choice won out. But it was never truly conclusive that it didn’t harm human health or the health of the animals (or maybe it was according to this 2009 FDA Review, except read the intro and the fact that long-term studies were never conducted, whoops!). Monsanto fought tooth and nail against any regulation. Their PR machine attempted to eliminate any efforts on labeling. But slowly they lost the battle. Milk started showing up on shelves labeled BGH/rBST free. It was a value add, but as the effects proved evident, it became obvious, consumers weren’t buying it. Monsanto tried to rebrand. After a while they sold it and now you’d have to search to find milk without a BGH/BST-free label. Whether that’s good or bad, I’m not sure. Now we’re at the same debate whether the consumer is truly right or not. Can we trust the consumer to make wise choices? I’d hope that GMOs would get a fair shake in the media and in the public and be judged based on the science, but there is just too much monkey business – on both sides. Anti-GMO folks are using scare-monger tactics and presenting shaky evidence. Pro-GMO folks are bulldozing and buying out any and all critics, working every media angle to force people to accept their products, whether they want to or not. This is really not about health. The key is the ability of people to choose. The independence of farmers to not have their fields invaded. The choices people want to make. But I fear the PR teams behind the pro-GMO are have learned their lesson from BGH and we’re in trouble.